Anagram: Noun: A word, phrase, or name formed by rearranging the letters of another. Can you name which TGA songs these are? Hint, there is one from each of these albums: Sink or Swim, The 59 Sound, and American Slang. Alright this one should be a little harder. Yep that's the song. Can you name the line? my first sin was a young american girl? Did you make these up yourself? We should try this with a larger range of music. 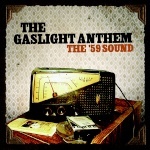 It isn't too difficult with the relatively small number of Gaslight songs out there. Here I got a couple. I put song first, then artist. To narrow it down, its from bands that have played with Gaslight before.